Last Friday, the U.S. Court of Appeals for the District of Columbia Circuit issued an opinion in Shelby County v Holder, voting 2-1 to uphold the constitutionality of Section 5 of the Voting Rights Act, which requires certain states and jurisdictions to obtain federal approval of election changes before they can go into effect. 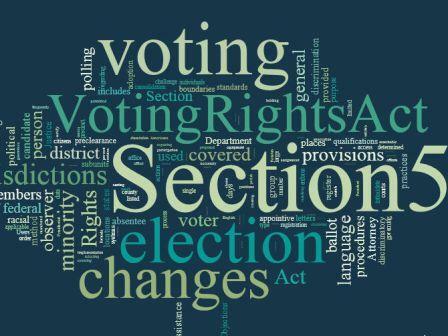 I’ve already blogged about the effects of Section 5, especially in the context of current national fights over voter ID – and any change in Section 5 that reduces federal oversight in covered jurisdictions would be significant to the combatants on either side of that and other debates. The appeals court’s Shelby County opinion used expert testimony and other data to find that Congress’ decision to extend Section 5 through amendments and extensions to the Voting Rights Act was entitled to judicial deference and thus is not unconstitutional. for another 25 years (and thus 59 years before the extension’s scheduled expiration). The oldest data–and a jurisdiction included because of the oldest data is every bit as covered as one condemned under the newest–are another eight years older. Indeed, Williams’ dissent only ruled that Section 5’s coverage formula was unconstitutional – not the entire provision (though he clearly has doubts about that as well). This argument – that even if the policy of subjecting state and local election changes to federal approval is constitutional, the formula for requiring that approval is not – may end up being significant in the inevitable appeal to the Supreme Court. It has been apparent for some time that the Shelby County case would be pivotal to the future of Section 5 of the Voting Rights Act; this latest opinion merely reinforces that. It is now a virtual certainty that the Court’s next term (beginning in October 2012) will see the most significant effort to date to end Section 5. Previous: NIST Statement on Internet Voting: Is It “Someday” Already? Be the first to comment on "Formula for Change: The Shelby County Case and Section 5"